Marvel Studios will kick off the summer movie season this weekend with the highly-anticipated Avengers: Infinity War, which will have a huge impact on the Marvel Cinematic Universe going forward, and, as it turns out, the studio's plans for San Diego Comic-Con. Marvel held their press junket for Avengers: Infinity War this weekend, and following their massive press conference yesterday, studio president Kevin Feige was asked about their plans for San Diego Comic-Con, where Feige confirmed there will be no Hall H panel this year. Here's what Vulture reporter Kyle Buchanan had to say on Twitter about his exchange with Feige. "Don't count on a lot of juicy Avengers 4 reveals at Comic-Con this year... Kevin Feige just told me that while Marvel will still have a floor presence, they're skipping the usual Hall H panel to let the dust settle from Infinity War." While this stance makes sense, in terms of letting "the dust settle from Infinity War", it's still quite surprising in that not only will the studio miss a chance to promote Avengers 4, but also Captain Marvel, which is currently in production and hits theaters on March 8, 2019. 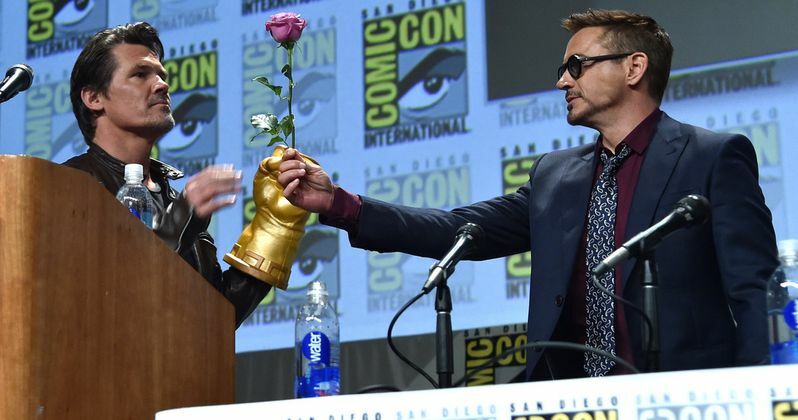 Still, at this point, Marvel hardly needs an event like Comic-Con to make fans aware of their brand and their films, but, on the years that they do show up in San Diego with a Hall H panel, it is often one of the highlights of the entire convention. Marvel Studios did show up last year at San Diego Comic-Con, where they unveiled a new trailer and poster for Thor: Ragnarok, a new poster for Black Panther and confirmed Ant-Man and the Wasp had just started production, along with Michelle Pfieffer's casting as Janet Van Dyne. The studio also confirmed details about Captain Marvel, including that the movie will be a period piece set in the 1990s, with the Skrulls as the main villains. Production had just recently wrapped on Avengers: Infinity War, with the production on a brief break before assembling the massive cast and crew for Avengers 4, which started filming in mid-August 2017. What's even more surprising about this reveal is that there also won't be a D23 Expo this year. Last year, Disney's biennial D23 Expo debuted a weekend before San Diego Comic-Con, with fans at both conventions getting an early look at Avengers: Infinity War, long before the first trailer was released to the public. Still, there is the possibility that Marvel could use other conventions like New York Comic Con in October to promote both Captain Marvel and Avengers 4, but it certainly won't be as much of a spectacle as the usual Hall H panel, and its raucous crowd of more than 7,000 fans. Another reason they could be skipping SDCC this year is because they have huge plans for 2019, which marks both the end of Phase 3 of the MCU, with Avengers 4 (May 3, 2019) and the start of Phase 4 just a few months later with Spider-Man: Homecoming 2 (July 5, 2019). Guardians of the Galaxy 3 has also been confirmed for Phase 4, but there isn't much else known about what Marvel has planned for this next phase of the MCU. Take a look at the tweet from Kyle Buchanan's Twitter below. Don't count on a lot of juicy AVENGERS 4 reveals at Comic-Con this year... Kevin Feige just told me that while Marvel will still have a floor presence, they're skipping the usual Hall H panel to let the dust settle from INFINITY WAR.